Decoration furniture is some furniture product which used for decorate house and make your room more interesting. Many people looking for unique and funtastic decoration to make their house looks beautiful. This time we introduce you about a unique decoration furniture for your house, especially your outdoor area. We called it as a giant card. It has adopted from card game and apply it in giant size for decoration need. 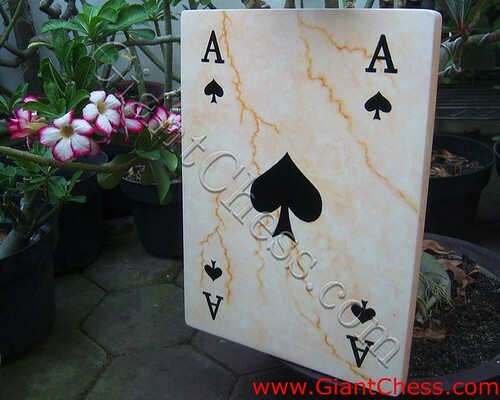 In the picture above we showed you giant card which polished in marble. It has made of Teak wood anda carved perfectly by our craftsman. It very durable for indoor and outdoor use. Many people use it for decorate their patio or porch area. You just need to find a beautiful color of giant card which suit with your house furniture. Find this kind of giant card in blue marble and others interesting colors.